My joint exhibition with Tina and Daniel starts today. Yes, today is show time at Gallery Movitz here in Stockholm. Tina Thagesson, daniel Luther and I are having a joint exhibition. It’s really exciting and I am very happy to be in the company of such great artists. They have a lot of experience so I’m learning a lot from them. 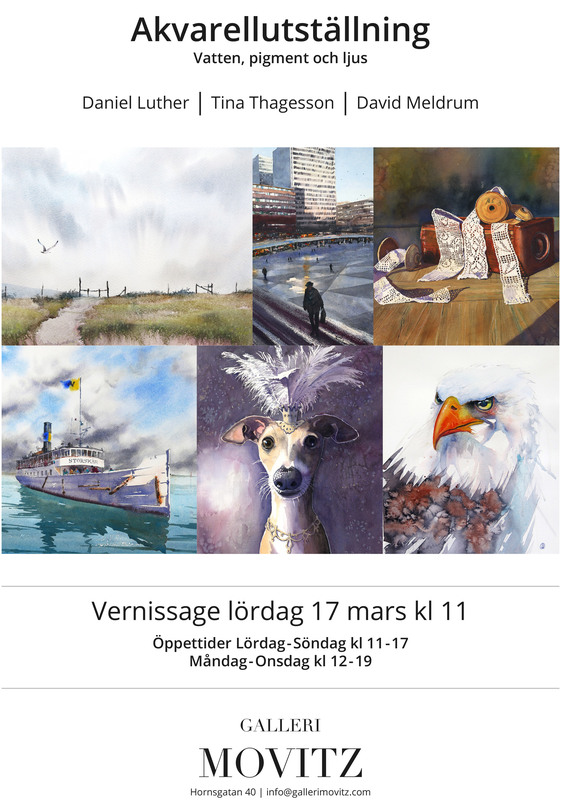 If you live in Stockholm please do drop by to Gallery Movitz, Hornsgatan 40. We open at 11.00 on the 17th of March. St. Patrick’s Day! You are very welcome. Author meldrumPosted on 2018/03/17 2018/03/17 Categories art, exhibition, galleryTags danielluther, david, davidmeldrum, exhibition, gallerimovitz, meldrum, meldrumart, movitz, Stockholm, tinathagesson, vernissage2 Comments on My joint exhibition with Tina and Daniel starts today. I am enjoying a long weekend, north of the Arctic Circle. The Photo below was taken 20 kilometres north of Kiruna, Sweden. The temperature was -32 degrees! I would not normally post holiday snaps on this blog but the experience was just so magical. You could say that the Sun and it’s solar storms were painting the night sky here on earth, a masterpiece. I received two great DVD’s in the post yesterday. 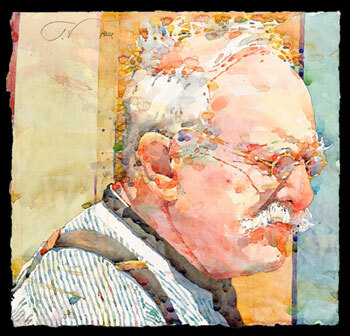 Watercolouring by Charles Reid and Alvaro Castagnet. I have watched the Charles Reid film and found it really inspiring, so hopefully you will see a big improvement in my watercolouring very soon! It would be nice to go on a watercolour course with these guys but I could not afford it. I recommend these tutorials to anyone who is interested in improving their skills. Not recommended for beginners. Go here if you would like to see more tutorial videos from APV. Ted Nuttall seems to live in a sunny warm climate, at least his paintings radiate sunshine and warmt, lucky him. 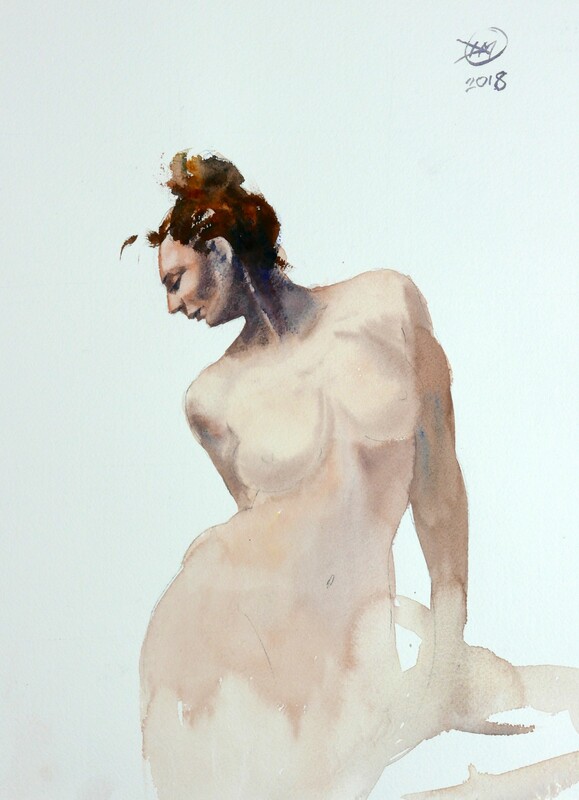 I have uploaded more life drawing sketches to my Picasa page. Click the photos below or this link here.